EXTRA LIGHT, WHAT A WEIGHT OFF YOUR MIND: No need to worry about your bag weighing too much when bringing your microfibre towel along anywhere. It’s a whole load lighter than any conventional towel. 220g of drying bliss lightening your backpack, gym and travel bag effortlessly. FREE UP SPACE, LARGE BUT COMPACT: No more need to sacrifice space for other things in your bag! The towel’s dimensions are 160 x 80 cm but once you roll it up it’s smaller than a pint glass so you can seamlessly tuck it into your carry bag or backpack, saving masses of space. 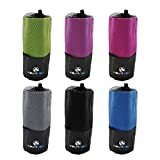 NO MORE SMELLY WET TOWELS, DRYS IN MINUTES: There is nothing worse than having a soggy wet towel to put back into your bag wetting all your stuff. This microfibre towel dries in just a few minutes. Laid out in the sun it becomes bone dry in no time, letting you get on with your day. Roll it up and pop it in its carry pouch while its mesh lets it breath for extra hygiene. STRONG FIBRE BUT SOFT TO THE TOUCH: Microfibre is strong and silky smooth against the skin. This also makes this towel perfect for laying on at the beach or whilst doing Yoga or Pilates. Just pop it over your mat for added comfort and grip. It’s also your perfect companion when working out at the gym, lay it on benches and carry it around your neck to ensure you stay cool and dry. SIX GREAT COLOURS TO MATCH YOUR PERSONALITY: With 6 colours to choose from there is no limit to looking good. Who says you have to sacrifice comfort for style! Quick Drying: Its horrible bundling up a wet towel into a plastic bag only for it to stink later. Or just chucking it in your bag so it can soak the inside! Microfibres are one fifth the size of a hair so with so many millions of fibres on the towel the surface area is increased so it dries super fast after use. Compact: Lugging around a huge standard towel is not always an option. Going to the beach or the gym can turn into a chore if your bag is swollen. The microfibre towel rolls up to the size of a pint glass! Lightweight: Not only is it compact but its also lightweight. It only weights 220g. You won’t even notice it in your bag. You cannot lose! If you’re about to jump on a jet and let go for a while you need to let go of all worries. This towel is just one addition to helping you live hassle free! Or if you’re regularly on the go and need to shower in between, this is a must have to take on your day.